From the always-interesting VillageNet Local History site: The Changing Face of Romney Marsh, 10,000 BC – 2000 AD, in eight steps, with maps and diagrams. A slightly more technical short article on the geology and geography of Romney Marsh. 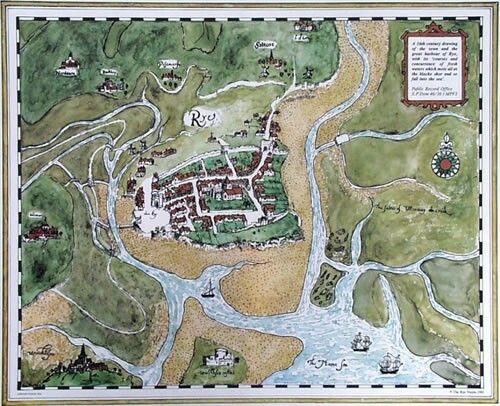 A map of the medieval harbor of Rye. In Feb 1287, a storm hit the southern coast of England with such ferocity that whole areas of coastline were redrawn – towns that had stood by the sea now found themselves landlocked, while others found themselves in possession of new harbours.In Hastings, the storm caused the cliff and with it half the Norman castle to fall into the sea, blocking off the harbour and ending the town’s days as a port. The old town took over as the port, but the protected inlet was totally destroyed. The old harbour is where the Shopping Centre in Hastings can be found. Further along the coast, the port of Old Winchelsea , an island which was where the current Winchelsea Beach can be found was completely destroyed. It was later rebuilt several miles inland, where it became the first example of town planning in England being built on a grid system familiar to our American friends. Despite its new hilltop position Winchelsea still retained its place as a Cinque Port . The most dramatic change wrought by the great storm was to the towns of Rye and New Romney . Before the storm New Romney was a thriving harbour town with the River Rother flowing through it into the English Channel. The storm silted up the harbour completely and diverted the river away from the town to enter the sea at Rye about 15 miles away. More or less overnight New Romney became landlocked, a mile from the coast. Hickling, Norfolk: in 1287 a great flood engulfed the village, and 180 people were drowned. The waters rose a foot above the high altar of the Priory Church. Hickling was one of the townships that suffered most severely from the tremendous storm of December, 1287, no fewer than nine score persons being drowned there. In the priory the water rose more than a foot above the high altar, and all the canons fled away except two, who stayed behind and managed to save the horses and other property by bringing them up into the dormitory over the vaulted undercroft. Few great weather events in British history were as devastating as the “Grote Mandrenke”, the great drowning of men, which took place in mid January 1362. A huge south-westerly gale originating in the Atlantic Ocean swept across Ireland, Britain, the Low Countries, and northern Germany, causing at least 25,000 deaths.The first warning of the storm came from Ireland, where homes and buildings in Dublin were devastated by the high winds. Next to experience the brunt of the storm was southern England, where thousands of trees were blown down. Massive damage was caused to the few high buildings, notably churches, and many spires or towers were destroyed. Most famously, the wooden spire of Norwich Cathedral fell through its roof. Worse was to come. As the storm reached the North Sea, it combined with high tides to produce the phenomenon most feared by coastal communities, a storm surge. Ports all along the east coast of England, and across the North Sea in the Netherlands, Germany and Denmark, were destroyed, as the power of the wind and waters changed the shape of the coastline. The Grote Mandrenke (Low Saxon for “Great Drowning of Men”) was the name of a massive southwesterly Atlantic gale which swept across England, the Netherlands, Northern Germany, and Schleswig around January 16, 1362, causing at minimum 25,000 deaths. …An immense storm tide of the North Sea swept far inland from the Netherlands to Denmark, breaking up islands, making parts of the main land into islands, and wiping out entire towns and districts, such as Rungholt on the island of Strand in North Frisia. This storm tide, along with others of like size in the 13th century and 14th century, played a part in the formation of the Zuider Zee, and was characteristic of the unsettled and changeable weather in northern Europe at the beginning of the Little Ice Age. An interesting article on the Grote Mandrenke’s role in the opening of the Zuider Zee — and thus, indirectly, the rise of Amsterdam as a great trading city. The North Sea incursions were catastrophic on a Hollywood scale: sea surges punched through the dunes (you can see the relics of the old coast in the line of islands off the west coast of Holland, Germany, and Denmark), killed perhaps 100,000 people, and turned vast agricultural districts into reed seas. In 1231, the sea flooded up river channels into the inland lake of Holland and by 1300 it had become a bay. In 1287, thirty villages in the lower Ems basin were drowned and the Dollart formed. In floods in 1240 and January 1362, sixty parishes in the diocese of Schleswig were overwhelmed, amounting to half the agricultural land of the realm, and perhaps 30,000 people died. The 1362 stormflood was the Grote Mandrenke, the “Great Drowning.” The island of Heligoland was 60 kilometers across in C.E. 800; by 1325 it was only 25 kilometers in diameter at the widest, half the loss having come in a single storm in January of that year. Today it is only 1.5 kilometers at the widest. The English ports of Ravenspurn and Dunwich drowned about the same time. The vanished trading city of Rungholt in Nordfriesland has achieved legendary status. Archaeological remains show it to have been a wealthy and substantial settlement for its time, though it wasn’t the Atlantis of the North Sea some have imagined. It was erased by the storm surge of 1362, along with the land it stood on. Perhaps inevitably, local lore says that if you sail across that stretch of water on a stormy night, you can still hear the bells of Rungholt ringing. There was a massive storm in 1550s which overran the welsh coast at Kenfig. It caused a massive influx of sand which completely covered the town. The UK Environment Agency reckons the Thames Barrier is good for most of the century. “In November, the Environment Agency set out its six-year study, Thames Estuary 2100. The report said the existing barrier provides a greater degree of protection than originally anticipated. 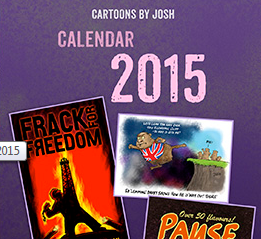 Now thought to be unlikely – interesting. I celebrate the great scientist and man. Interesting events…almost sound like hurricanes/hybrid systems – a more powerful version of Hurricane Sandy. Was there any reported impact in the London/Thames River area or did these occur before it was founded? @Vukcevic: The “Verbum Dismissum”=”Missing Word”, is ELECTRON, electricity, and Nikola Tesla was its greater prophet. The Spanish Armada ran into severe storms off Scotland in 1588. Wikipedia tries to suggest a link to polar ice off Greenland, without any evidence other than the title of a book published in 2000. After the surviving ships returned to Spain, says Wikipedia, it was reported that, when Philip II learned of the result of the expedition, he declared, “I sent the Armada against men, not God’s winds and waves”. The analysis of ‘land height’ in the VillageNet Local History site: The Changing Face of Romney Marsh, 10,000 BC – 2000 AD can also be thought of as a ‘relative sea level rise’. Then the descending log series could represent some large gravitational event some 12,000 years ago that is still ‘ringing’ though the Earth’s Oceans. Another way to look at ‘sea level rise’? It looks like that’s about 1/3 of the way into the “spike up” from 500 AD (1500 BP) to 1800 AD (200 BP). If the same pattern holds now, we’re at the dead bottom just past 1990 AD, so about point D on this chart: http://www.pnas.org/content/97/8/3814/F1.large.jpg past 2100 AD we ought to start getting ‘bad stuff’. This Grand Minimum ought to be just bad weather and cold, but not LIA cold. The NEXT Grand Minimum ought to be a LIA and likely the tip into the next full on glacial. BTW, I’ve been pondering a ‘blast screen’ for buildings based on Tesla’s valve for his turbine. The one with no moving parts, only the shape, that gives effectively an ‘air diode’… Ought to be able to make a concrete wall of it with walkways down the middle, but wind and blast air flow would be stopped. Think it would work? Fascinating stuff. The legend of the ringing bells of Rungholt sounds like it could be the setting for an episode of the original Scooby-Doo series. It’s probably good to get these stories told sooner rather than later, before the next episode of catastrophic-you-know-what.